Product #16869 | SKU VCTVPR100 | 0.0 (no ratings yet) Thanks for your rating! 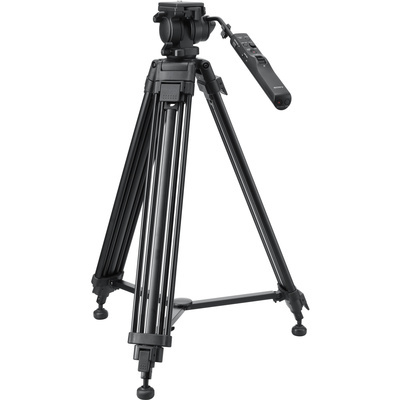 The Sony VCT-VPR100 Remote Control Tripod connects to a wide range of cameras via included cables to provide convenient remote control functionality. A multi-terminal cable, an A/V R cable, a remote terminal cable, and a LANC cable are included. Any video/still camera with a multi-terminal port, A/V R port, remote terminal port, or LANC port is compatible. The tripod rises to a height of 150.5 cm and boasts quick release but that's just the beginning. The ergonomic handle of its fluid head is actually a detachable wired remote. The remote provides start/stop and zoom and slow zoom control for use with select camcorders and hard button control of power, grid lines, zooming and shutter depending on the camera in use. The flip-lock leg sections make setup a snap as does the built-in bubble Level.